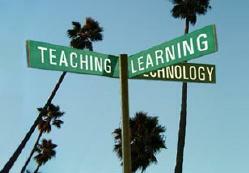 Teaching and Learning are the acts, processes, and experiences of imparting and gaining knowledge or skill. Unless you are completely isolated from your environment, teaching and learning happens all your life. Hence, I care about this topic and like to think how to effectively teach and learn, and about basic principles and how to communicate them. In the last three years of high school I attended a class called 'Pedagogy' or 'Educational Theories'. Here I was introduced to alternative school models and Gestalt therapy. At the University of Cologne I taught one-week classes on TeX, mainly in a not-too-effective lecture style, but the format didn't allow anything else. At the University of Missouri-Columbia I taught physics laboratories, and math classes. I also tutored for the Total Person Program of the Athletic Department. I was part of the Graduate Teaching Scholars in 1998-99. This program is not currently active as a separate entity anymore because it became part of a teaching minor at MU after I graduated. I also received the Donald K Anderson Graduate Student Teaching Award in 1999. On March 19, 2001, I was the Honorary Coach for the Big XII Women's Softball Team at the University of Missouri-Columbia, nominated by pitcher Stefanie Falk. After my graduation from MU, I worked as a high school math teacher at Christian Fellowship School (a ministry of Christian Fellowship church) and I taught the summer physics class at Columbia College. Since my visa status changed that summer I only tutored physics privately since then. Also, leading Bible studies for Chi Alpha gave me many opportunities for teaching and learning. While I was at MU I studied the field of Physics Education Research and I learned how much more effective classes are that are taught in an 'interactive engagement style' vs. a traditional 'lecture style'. Besides communicating science effectively (see my journalistic articles in the newspaper 'Columbia Missourian'), I am always interested in sharing the Gospel and how to witness. What motivates me is thinking about how science and religion are connected and to teach this. Fun stuff! While I was in the Graduate Teaching Scholars program we developed a Teaching Portfolio, including a Teaching Philosophy Statement. They were written in 2000, while I was mainly teaching physics labs. I haven't updated them recently, because at this point in time I am not teaching physics. The basic ideas didn't change, though, so you can download them here. Here is a standalone version of my Statement of Teaching Philosophy. Also, check out my presentation on the importance of interactive engagement teaching, see the Physics Education Research page.